The General Staff Organization (GSO) invites you to get away from your desk and join your fellow UWB staff for a summer celebration! We will be eating, announcing the GSO scholarship winners, giving staff a chance to vote in the GSO elections, as well as gathering feedback on campus strategic initiatives. Stop by to give your fellow staff a pat on the back for all their hard work! We want to ensure there is enough food for everyone so units and/or individuals are encouraged to sign up for items to bring to the potluck on this excel sheet. If you cannot access the spreadsheet, please either request access or email Ashley Magdall (GSO Secretary) arm29@uw.edu. Don’t have the time or passion to cook? Consider giving a donation in-person to Ann Busche in the School of Education (Potluck co-chair) or Jim Pilon in Fiscal & Audit Services (GSO Treasurer) or donate today online! Donations for potluck food will be accepted until 5pm June 27th; donations submitted after will be kept in the GSO discretionary fund to support future GSO events and staff scholarship opportunities. The annual staff appreciation party is an event that is co-hosted by the General Staff Organization (GSO) and Organization Excellence & Human Resources. The goal is to make staff members feel appreciated for their hard work; staff enjoy food together and receive awards for their years of service with the university. 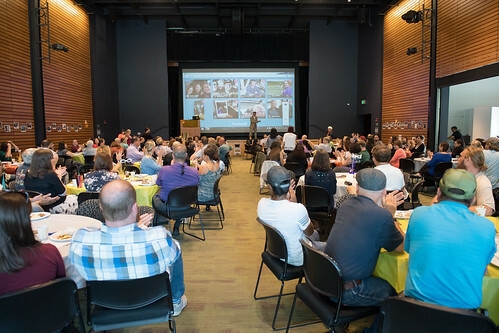 This year the staff appreciation party was held in Mobius hall where a catered breakfast was served to 200 staff members.The UW Bothell news team wrote an article that recaps the event and references the Tagboard for #uwbstaff and the award winner Christine Straight who won the 2017 Staff Appreciation Award. Enjoy the image gallery below from the event held on August 22, 2017. Hover mouse over image to click through gallery.